Eire Og were worthy winners of the Martin Cup as history repeated itself in another final against St Malachy�s at Casement Park, a repeat of the 2001 Junior Championship final. Three second half goals overturned a 5 point half time deficit to give the Ogs another Martin Cup. Disallowed goals, sendings off and a great comeback provided great entertainment � for the Ogs! The first half produced little excitement and neither side looked like deserving winners. The Ogs played well out of defence but struggled to find their forwards and, more often than not, took the wrong option in front of goal. As a result, it wasn�t until 15 minutes into the game that Barry Hall�s point put Eire Og on the scoreboard, by which time St Malachy�s, who did take their chances well, were 1-03 to 0-01 ahead. Peter Elliott put over two frees and the Ogs trailed 1-05 to 0-03 at half time. The stand-in management duo of Waldorf and Stadler had their work cut out. After the first half nobody could have expected that the game would come to life as it did, but the Ogs got off to flying start. Second half substitute Niall �Nibbles� Rice immediately pointed to reduce the deficit and lift the team. 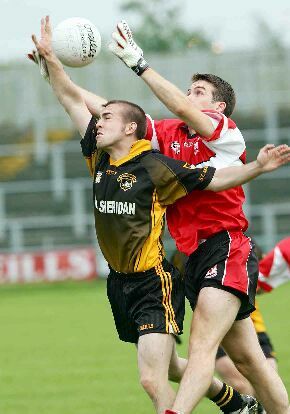 Fellow sub, Lawrence Kelly, won plenty of good ball in midfield and Eire Og were now dominating. Paul Taggart unleashed an unstoppable drive that went in off the underside of the crossbar to leave one point between the teams. Barry Hall and Peter Elliott scored points to put Eire Og a point ahead for the first time. The Ogs now felt that the final was there for the taking but then disaster struck. The wet conditions had proved difficult for everybody, but no-one more so than for the Ogs keeper and resident (failed) juggler come David James impersonator. A shot fell short, heading straight to the keeper, but as he dropped to his knees the only thing he clutched was his head as the ball eluded him and rolled over the line. This was however to be St Malachy�s only score in the second half. The Ogs could have let their heads drop after this but they were determined to win. Substitute Sean McKenna got on the end of a flowing move, involving Cathal Mervyn, Lawrence Kelly and Paul Taggart, as he flung himself a la Superman to punch into the net. The Ogs celebrations were short lived however as the referee, despite first giving the goal, consulted with his umpires who both gave a square ball. Despite these disappointments Eire Og became more determined. Sean McKenna pointed twice before Eire Og scored their second goal. Paul Taggart, going for his second goal, crashed the ball against the crossbar and as it bounced up Johnny �Don�t take me off or I�ll cry� Quinn was there to fist into the net. The Russian linesman was called to order as there were claims that Taggart�s shot had crossed the line, but Quinn deserved his goal for his determined display and celebrations. Peter Elliott and his marker were sent off after a scuffle following some over zealous tackling and retaliation, but to be fair there was nothing much in it and the referee had to take some of the blame as he allowed play to go on despite Elliott repeatedly beating fouled. St Malachy�s knew that the game was up and the fight seemed to drain out of them. Niall Rice found the top corner for a third excellent goal and Colm McAuley had the last say with a long range point from play. 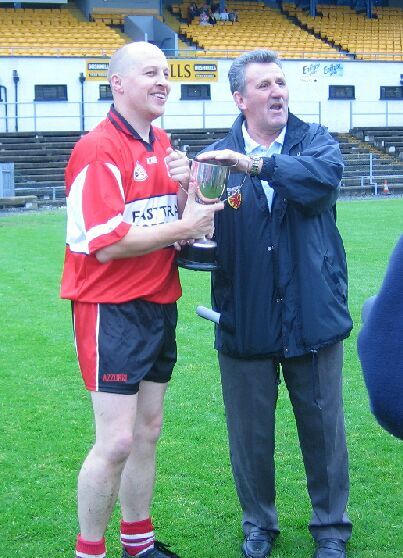 Conor Muldoon lifted the Martin Cup � a deserved success. Coach Browning made the long distance phone call to inquire about his charges. It was a shame he couldn�t have been at Casement Park himself after his hard work this season. Scorers for Eire Og were Niall Rice(1-1), Paul Taggart(1-0), Johnny Quinn(1-0), Peter Elliott(0-3), Sean McKenna(0-2), Barry Hall(0-2) and Colm McAuley(0-1). The experienced spritely full back line of Fintan Morgan, Conor Muldoon and Fergal Gribben were excellent. They put in challenges, broke the ball and didn�t allow their men any space, leaving the Ogs keeper (luckily) with nothing to do. Cathal Mervyn had a great game at wing half back, Keyvan Vesali never stopped running and battling all game on the other wing, while Fra Grimley linked well with attack. In midfield Colm McAuley put in a great performance and was rewarded with his late point. Gerry O�Reilly fielded well but his old legs let him down. His half time replacement Lawrence Kelly rolled back the years with a strong performance. Peter Elliott, Adrian O�Reilly and Paul Taggart caused the St Malachy�s defence all sorts of problems with their runs while up front Barry Hall led the line well with Anto Donnelly and Johnny Quinn also causing havoc. Sean McKenna and Niall Rice both scored as second half substitutes and Stevie McCoey bolstered the defence when he came on. A sponsorship deal with No More Nails awaits the Ogs keeper � it will be renamed No More Goals. Waldorf and Stadler aka O�Neill and McGarrity will be challenging Crik for his South Antrim managerial post, the O�Reilly brothers will be lamenting their first yellow cards ever (and Muldoon never even breathed on his man! ), Fra put off his party to finish the match, though he wasn't looking forward to extra time, while as usual the Ogs have a dozen potential new managers following the post match pints! 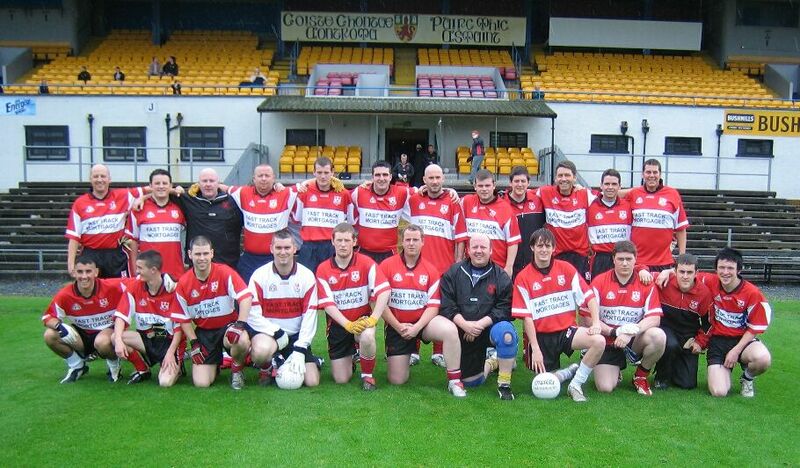 The Ogs secured a hard fought victory after extra time in this Martin Cup semi-final played at McCrory Park. The Ogs started brightly and totally dominated the early stages with JP Dunney and Colm McAuley winning plenty of ball in midfield but the Ogs forwards, despite great approach play, struggled to convert simple scoring chances and registered wide after wide - 11 in total in the 1st half. Whatever limited possession O�D�s had they made full use of and the Ogs full back line of Muldoon, George and Morgan were kept busy by a nippy O�D�s full forward line. In one such attack, a high ball caused confusion in the Ogs defence and with goalkeeper Vernon getting in a tangle with his 2 defenders the ball fell to an unmarked forward who struck the ball into an empty net to put O�D�s in control. Despite 1st half points from McAuley and defenders-come-forwards, PaulTaggart and Ciaran Ryan, the Ogs trailed at the break 1-05 to 0-03. With the Ogs playing down the hill in the 2nd half, the Ogs half back line of Vesali, Grimley and Gribben supplied excellent balls into the half forwards with Doherty, Taggart and Quinn constantly first to the ball and causing havoc in the O�D�s defence. Again it was oneway traffic and with points coming from McAuley, Donnelly, Quinn and Taggart and an opportunist goal from McLaughlin, after linking well with Taggart, left the scores level nearing the end of the game. In a frantic final 10 minutes the lead changed hands several times but when the ref blew for full time the teams couldn�t be separated and were level at 1-08 to 1-08. Alas this wasn�t to be the end of the match as the ref ruled that extra time would be played. Coach Browning urged his troops to give one final effort and he wasn�t to be disappointed. With Dunney and McAuley again dominating and Taggart the pivot for most of the Ogs attacks, full forward O�Neill, who had up till this point had a quiet game (by his roving standards!) got on the end of a sweeping move and blasted to the net. Another Ogs goal soon followed, this time a fine solo effort from Taggart(aided by rather dubious handling from the O�Donnell�s keeper) and the Ogs had all but booked their place in the final. What happened next is best described as bizarre. Totally oblivious to his team-mates one of Coach Browning�s prized players left his marker, team-mates, opponents, referee and spectators for dead and declared to Crik �I have to go now � the Ballynahinch Booze Bus is leaving!�, and Forrest Gump-like he jumped the perimeter fence and was last seen running down the middle of the Whiterock Road with smoke bellowing from his boots and has not been seen since!  With Coach Browning in a daze O�Ds staged a late rally, scored a goal and only an excellent save from Rowan Vernon kept the Ogs lead intact to the final whistle. It would be wrong to highlight individuals for special praise as this was an excellent battling team performance and we can now look forward to a final day out at Casement. In the post match celebrations it emerged that Coach Browning will be in the USA on a family holiday for the final. Frantic efforts are being made to fly Crik back, so if anyone has any unused air miles, access to a private jet, or would like to sponsor Crik�s trip home then please get in touch.